As impractical and improbable the idea of buying a house, even a tiny house, in France had first seemed to me and to my husband, Joseph, when we began traveling to France many years ago, it gradually became an inevitable decision and an exciting adventure. Our knowledge of the intricacies of French ownership, like our budget, was limited. Yet we had fallen in love with France, and knew that with patience and research we would ultimately find a way. This is our story. Like so many Americans, we had spent time in Paris and other parts of France and had come to appreciate the grace and beauty of the country. So much history, so much passion, and - as Gertrude Stein described Paris - "exciting and peaceful" at the same time. Normandy stood out for us as the part of France where we felt most at home. The farmland, orchards and small forested areas reminded me of upstate New York where I had grown up. The people of Normandy were welcoming, and the local cuisine was outstanding. I began canvassing French real estate websites, and soon had a cadre of favorites that I returned to on almost a daily basis. "Cle France" at http://www.clefrance.co.uk always had some tempting properties in all price brackets. I enjoyed searching by category. If I picked "ready to move into," I could search by price. "Descending" allowed me to begin with a few Norman chateaux, starting at over ten million euros. "Ascending" brought me closer to my desired price range: ten thousand euros and climbing. One day in April, 2014, I spotted a stone village house being offered for a modest five figure sum. (Screenshot below now shows it as "sold"- to us). There was no land, and I soon discovered that it was really just half of a house - the half that looked onto one of the town squares. The existing rooms (not counting the attic space) amounted to about 40 square meters - maybe 430 square feet of living space. 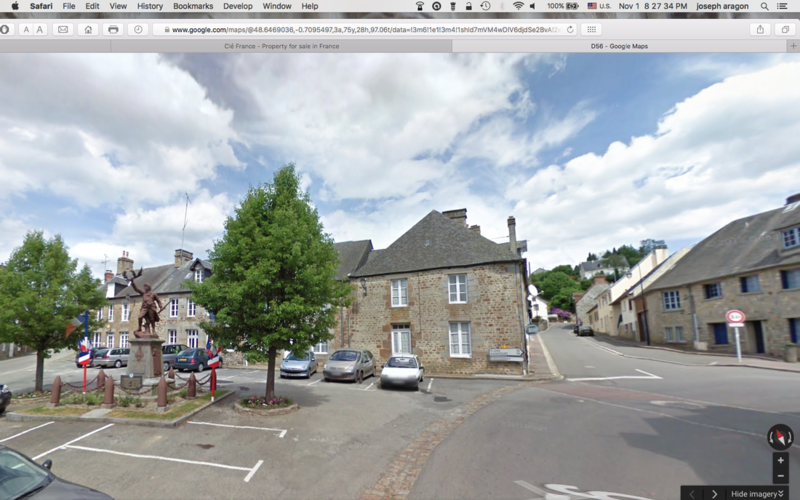 The accompanying text explained that the house was in the town of Lonlay l'Abbaye, so we found it on the map. With Google Street View, we were soon walking the main streets and spotted the location of the house - overlooking the war memorial and a cluster of trees. I continued my virtual walk around the village over the next few days. 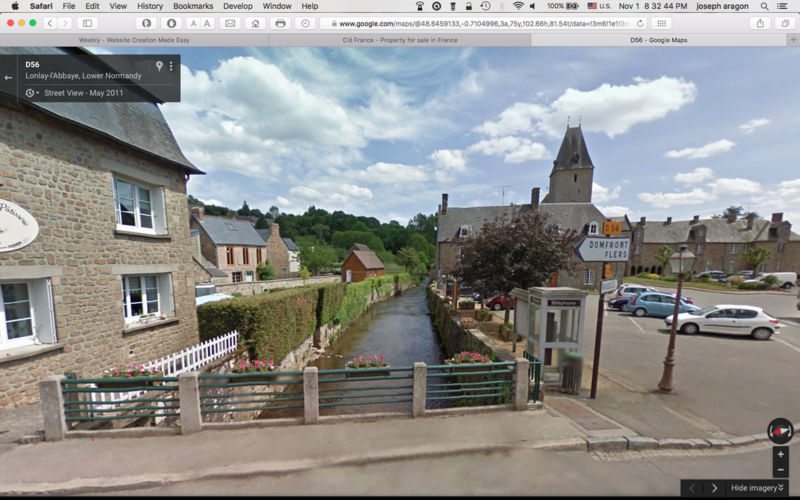 I had been disappointed in the past by villages with inexpensive properties, but Lonlay l'Abbaye was utterly charming. A stream could be seen running through the village, with the tower of its 11th century abbey in the distance. The location of the village is excellent, almost due west of Paris by several hours, in the direction of Mont St. Michel. I was smitten, and persuaded Joseph that we needed to make an offer - sight unseen - for this small village house. And so began our foray into the amusing world of French property purchase and renovation. We hope that you will enjoy the other pages of this website which give more information about the house, Lonlay l'Abbaye and its environs. You can follow the intermittent progress of the renovation and our visits to France through my blog. Just click on the items that interest you most. Your comments and questions are always welcome. Enjoy!